Why is left-skewed called negatively skewed and right-skewed called positively skewed? I'm curious about the nomenclature: why is left-skewed called negatively skewed and right-skewed called positively skewed? My short answer is that it is by design. The skewness measures are usually constructed so that the positive skewness indicates right-skewed distributions. Look at the expression above. When there's more weight (of the distribution function) to the right of the mean then $(x-\mu)^3$ will contribute more positive values. The right of the mean is positive, because $x>\mu$ and the left is negative because $x<\mu$. So, mechanically it would seem to answer exactly your question. 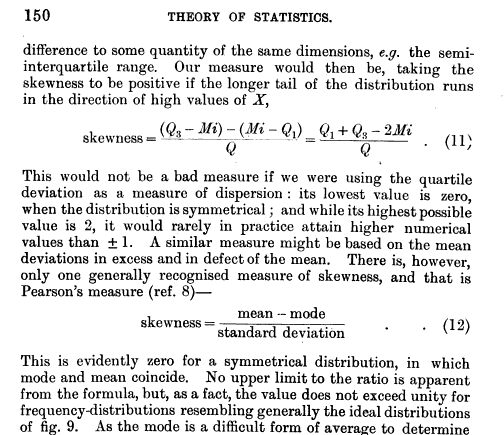 However, as @Nick Cox brought up, there is more than one measure of skewness, such as Pearson's first coefficient of skewness, which is based on the difference $mean-mode$. Potentially, different measures of skewness could lead to different relations between positive skewness and the tendency to have heavier tails on the right. Hence, it is interesting to look at why these measures of skewness were introduced in the first place, and why do they have their particular formulations. Not the answer you're looking for? Browse other questions tagged terminology skewness or ask your own question. How to tell if my data distribution is symmetric? how to transform data of two experimental groups? one is positively skewed and one is negatively..
What is the reason the log transformation is used with right-skewed distributions? Standard deviation to describe variation in positively skewed data? Skewness - why is this distribution right skewed? What is a positively skewed distribution that can include zero?